It’s truly heartbreaking that so many American citizens lost their homes and everything they worked so hard for as a result of Superstorm Sandy. 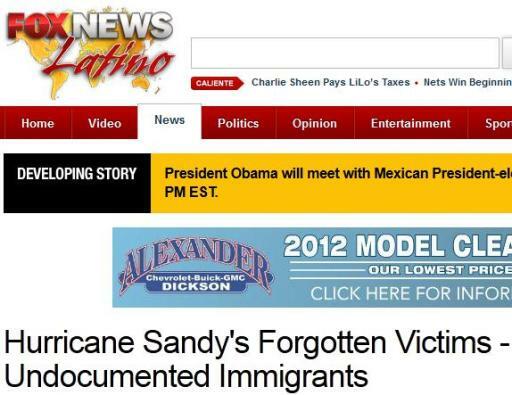 But on top of that, there is the insult added to injury with news “report” sob stories about how illegal aliens are the “victims.” That includes FOX News, which has an amnesty agenda, appeals to illegal aliens through FOX News Latino, and has a headline, “Hurricane Sandy’s Forgotten Victims – Undocumented Immigrants.” Disgusting. My favorite part of a similar sob story from AP story is the fact that Mexican diplomats are going to shelters to advise illegal aliens from Mexico how to apply for American food stamps and other entitlements. Hey, I guess if Homeland Security tells ’em how to do it, why not the Mexican government, too? Superstorm Sandy plunged some immigrants living illegally in the U.S. into darkness and even deeper into the shadows. Some of those who need help to get temporary housing and food are afraid to come forward because they risk deportation. And many have returned to damaged, powerless, moldy homes because they have no other place to stay. . . .
“If you are here illegally and you are at your home and see the National Guard and people in military uniform, going up and down, sure, you are going to be afraid,” said Gonzalo Mercado, executive director of El Centro del Inmigrante, a nonprofit that helps day laborers and their families in Staten Island. “To not be informed means to be afraid. That is why we are here, to inform immigrants of resources available to them,” Mercado added. Hilarious. The Mexican government is instructing its own people who are in our country illegally how to get money from us and will only pitch in less than $200K for its own citizens. We are chumps, indeed. Because [Miguel Alarcon] Morales’ children were born in the United States, he can apply for Federal Emergency Management Agency help, but he has been hesitant to do so. “When one has no legal documents, that person will always think that there can be repercussions,” said Morales, who lost his job at an ice cream store in New Jersey that closed after the storm. He now works part-time at a bakery. . . .
Mexican day laborer Eberto Silva didn’t have to look far for such a job – his landlord hired him at $14 an hour to do cleaning and demolition work at an apartment complex in Coney Island. Groups that are part of the National Day Labor Organizing Network have also brought day laborers to do volunteer cleanup activities on weekends. El Centro del Inmigrante is trying to become a hiring center for day laborers, making sure that they work in safe and secure conditions. What a joke. What a joke this country has become. And the thing is that these illegal aliens have nothing to fear about being deported. Unless they have a very serious criminal record, Immigration and Customs Enforcement (ICE) won’t touch ’em. Because, hey, we need to ensure a solid electorate for the Dems for generations to come. The critical difference about our immigration policy as compared to those of most other nations in this world is this: While we focus upon the needs of the immigrant, even illegals, who are statistically likely to become dependent on government (i.e., taxpayer-supported) services, other countries place their own national needs and priorities in the forefront. You might find it useful to check (via the internet) on the immigration policies of such oft-mentioned destinations as Australia, New Zealand, Spain, et al. You will quickly learn that (A) if they don’t need your skills or investment money, you’re unlikely to be permitted to immigrate and get a job … and (B) you certainly won’t be allowed to freeload on government programs. If planning retirement, you must bring assets to prove self-support. So, they are homeless, broke, and out of work. Why don’t we just hand them $1000, and put them on a bus to Mexico? It would be cheaper than keeping them here, and they have nothing at the moment, meaning all that they will have in the future is what we give them/let them take. They are the socialist stronghold robbing all future generations. Illegal Immigrants vote for Obama. This is merely peanuts now. Small potatoes compared to what is ahead. Many still DONT GET IT. A permanent Leftist-controlled goverment will be the final result of unhindered immigration — legal or illegal. How long do you think it will take until they discover they can transfer wealth from your purse to their pockets? Its all over but the cryin’ which will primarily be done by our grandchildren. Enjoy the life you now have. Our grandkids will pick up the tab in more ways than one. Those citizens of US who will be Sr. Citizens in the coming years will feel the resentment of their grandchildren for the heavy tax burden they inherited from their negligence, so don’t expect any assistance from them through legislation in the future. There will be a climate of hostility toward the elderly for their indifference today. Not surprised in the least. It’s pandering to the ultimate degree. Obama Regime so hard up for future votes it now doesn’t even matter if they are American or not! Hurry up liberals and get these illegal immigrants in housing and fed, clothed and comfortable….BEFORE you even begin to help the real victims of Sandy in New Jersey or New York. Never mind these people ARE property owning tax payers ! HELLO Barack Obama/Admin. you all a bunch of Traitors and I hope WE (true Americans) get to see you and your corrupt-ocrats hang by your toes just like Mussilini..You Bastards! p.s. I’ll be glad to tie the rope(s)! And ask those narco-enabling Mexican Federales IF they are so accommodating to the Guatamalian illegals (and other South American illegals seeking to get into the southern border of Mexico) for narco-state, drug-cartel loving Mexico governmental programs? No, I didn’t think so. This country is full of a bunch of self-empowering, disgusting politicians who will bring it all down (girl) to keep a seat in the upper party. Disgraceful!! Also Skunky, the Mexican government is implicitly admitting that it could really care less about its own nationals. Mexico is not that poor a country, and yet it hands out amounts that would embarrass any Haitian official. You would also expect any normal government to try to get its own working age nationals to return home to Mexico after such a disaster. No, instead they are told to go on public assistance in the United States. I guess there is not much pride left in Mexico, whether you are referring to the government or its people. Mexico has not been held to account for its behavior in the areas of drug trafficking or illegal immigration. It gets a pass for acts that would be deemed to be hostile by any country. Mexico certainly does not tolerate this sort of garbage on its border with Guatemala. The cross border infiltration down there is a trickle when you compare it to what the United States has to deal with. A Guatemalan or Honduran who chances to cross into Mexico faces the prospect of being robbed, raped, and shot. This description only refers to the official welcome these people may receive after crossing the border. The locals and landowners are also more than happy to exploit their undocumented. Fabulously stated, Worry. Thank you. I hope those of you who are not hispanic/latino are getting that you should NOT pander to the fraud of what is said about hispanics and latinos. You don’t have to be one to point out what a joke their talking points are. It’s easier, yeah, but if something is not true you shouldn’t feel shy about screaming it from the roof tops…no matter the “identity politic” groups the liars belong to. For the most part they’ll just slow down on the looting while the cameras and politicians are around. Then they’ll be back to stealing things from citizens that refuse to protect themselves. Too bad there are so many clueless victims. LIke the dumb lady that lost her marina and hugged BHO after he told her he’d help her out. I can already see the endless fraudulent claims being perpetrated by the illegals with assistance from the Bolshevik Bleeding Hearts Club (the Obumf**k administration) and paid for by those of us who work our asses off, try to make an honest living, and get taxes raised higher all in the name of humanity. Oh, and when a number of these miscreants get nailed defrauding the politburo, you think you’re going to find any enforcement action out of the limp-d**ks in ICE or DOJ? You said it. We have become a joke of a country and it’s only getting worse. They’ve got to be kidding me. Of all the tragedies of Hurricane Sandy,illegal aliens who weren’t exactly on my list of victims.